Villa Riina. The best you can get in Sri Lanka ! Private luxury beach villa ! Property 5: Villa Riina. The best you can get in Sri Lanka ! Private luxury beach villa ! Beach Villa - perfect pool - great garden - superb staff. PURE PARADISE! Property 7: Beach Villa - perfect pool - great garden - superb staff. PURE PARADISE! Superb villa in beautiful gardens close to beach. Property 14: Superb villa in beautiful gardens close to beach. This Riverside Villa perfect for Relaxation. Property 16: This Riverside Villa perfect for Relaxation. OLU VILLA Set in a Lush and Serene Garden. Property 34: OLU VILLA Set in a Lush and Serene Garden. We have just returned from a great relaxing family holiday, staying at Serendip. The place was very clean, well maintained and has all amenities we needed and was a large and comfortable space. We didn't want to come back... The location is a 5 minute walk from Hikkaduwa beach which has a number of good restaurants and bars. Rickshaws and taxi's are available when you want to travel further and are really reasonable. The bedrooms are all off off of the main living area which has a large dining table, internet access and TV, DVD and CD player. Air con throughout the villa is good and not overpowering. The kitchen is a good size, has a washing machine and all you would expect in a kitchen is here. Helpfully, towels are supplied and are plentiful making packing easier. 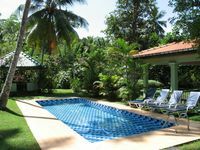 The pool is a lovely respite from the heat, and coconut trees provide some shade in this area, dappled sunlight comes through but fierce sun is avoided. A bird of Paradise visits at about 4pm every day! John had provided us with all the information we would need and was friendly and helpful throughout the booking process. He was patient with us when we tried to organise things from both India and the UK. We were greeted at the airport warmly by manager Sarath, who was very capable, relaxed and helpful throughout our stay. He left us his BBQ when we bought fish from the harbour, delivered food from the hotel for us in a rickshaw (which is really helpful when you have a 1 year old baby)! and sent us in the right direction for everything we needed. For anyone who chooses to stay in the villa, I would say you could trust that you are getting the best service and best deal from Sarath. And he does great rice curry! Even the night watchman was helpful.. I would reccomend this holiday for anyone who wants peace with access to bars and restauarants and a relaxed beach holiday. We travelled with a 1 year old who had a great time and made good use of the shady verandah and pool. There is very little I could add about the villa in terms of improvement...the efforts made to help us were great. The inclusion of a travel cot and highchair would have topped it all off well, but this is a totally personal requirement! Well done to John, Yin and Sarath for providing a great spot with the personal attention you would expect from a resort style set up without being intrusive. Thanks for letting us stay.